In the video below, Trends Journal publisher Gerald Celente discusses the US propaganda war against Russia and how the MSM is working as the Obama administration’s mouthpiece to frame Russia as the “bad guy” in the eyes of the American public. No doubt Russian President Vladimir Putin has his faults, but the situation in Ukraine was prompted by US interference by supporting the ouster of the duly elected pro-Moscow President of Ukraine, to be replaced with neo-Nazis that supposedly are “pro-West.” Once Russia stepped in to protect it’s interests, the US started rounds of sanctions, rhetoric and threats. Celente provides example after example of how the US media is pushing this propaganda with the term “pro-Russian militants,” in every paper Celente holds up this term, these keywords” are circled to show the coordinated effort to influence Americans in a propaganda war. Celente also asserts there is “no end in sight” to the crisis in Ukraine. 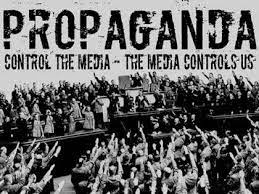 Control the media, control the people.